I've been helping a friend/colleague with some design and technical issues on a new typeface for a client. I just heard today (with the final font due tomorrow) that the final font family name is supposed to have a numeral in it, like “Glurbish 2000”. I have a vague memory that there were once problems in at least some apps with having numerals in font names. Is this just poor memory on my part? It may be that it was just a problem with translating numerals in some wacky truncation scheme being used for Mac AFM files or something? Thanks for any info anyone can offer on this point. FWIW, I use numerals regularly in the names of development iterations (to be clear: yes, in name fields of generated fonts) and I have not encountered any issues in Mac OS — Adobe CS6 apps, Quark 8, Pages, Word for Mac 2011 [other issues in Word, but not numeral related]. I can imagine older problems with numerals in Postscript name, for example, but none recent that I have encountered. I really liked Frutiger's numbering system, too! As long as there are no figure glyphs in the PSName, it should all be good. We've been using numerals in font names off-and-on since the mid 1990s. We've always heard warnings not to, and we've yet to hit any major problems ... with one important caveat: don't start a font name with a number. This can indeed cause problems in some (mostly older) systems. Most recently, I used absolute px value numbers in the names of the Slabo fonts, and we've not heard of any issues. For the Neue Haas Grotesk fonts Christian Schwartz opted to reinstate a Univers-esque numbered system — with numerals prefixing the style names, e.g., Neue Haas Grotesk Text Pro 75 Bold, Neue Haas Grotesk Text Pro 76 Bold Italic, etc. And the <namerecord nameID = 6> for those two are NHaasGroteskTXPro-75Bd and NHaasGroteskTXPro-76BdIt. Linotype did the final production on those. I don’t know if there have been any problems in the field, but these are out in the marketplace. Note, the numerals here are in the style name not the family name. I heard the rumors back in the good ol’ PS-fonts days too, and hence at DTL we never included numerals in the names of PS fonts meant for distribution. But as you know the specs did not mention this limitation. You're without no doubt more than anyone else here familiar with Font Naming Issues, Technical Note #5088, 12 April 1993 from Adobe Developer Support. excerpts: ‘From the font developer’s perspective, font naming begins with consideration of the basic family name of the typeface being implemented. This name is used as the value for the FamilyName keyword. The complete name must then be constructed, including elements denoting the style, weight, width, and character set. This complete name, which may include abbreviations but not spaces, is used for the keyword entry FullName. This must then be transformed into the FontName. Although this name may, theoretically, be as long as any PostScript language name — in practice, Adobe limits it to 29 characters […]. This constraint may necessitate abbreviation of portions of some font names. For File-name "Lobster 1.4.otf" / Family-Name "Lobster 1.4" I had only one report of a problem. Not that bad considering it was installed on millions of computers. The problem was not even related to use of the Numbers, but related to the use of the Dot in the "file-name" (not in the family-name). It only affected one particular FontManager, but not any other app. I can't remember which font manager it was. The user solved it by removing the Dot from the file-name, simply by renaming the file to "Lobster 14.otf". 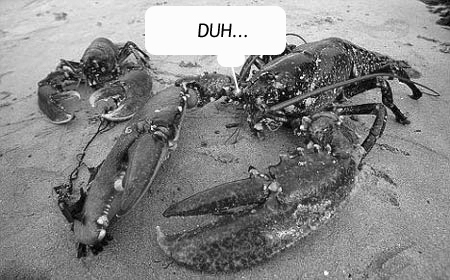 Which is 10 times the amount of lobster for the same price! I think the dot in a font name will cause problems when the font name is referenced in code. The popularity of the "Code 2000" font suggests that numerals are not problematic. One of our bespoke typefaces for Channel 4 Television here in the UK contains, unsurprisingly a '4' in all family names. It has been used by a huge number of agencies over the past 10 years without issues, so I think generally using figures is ok. I've seen issues with fonts with a number as the first char, since I thought it would be smart to prepend a timestamp string.